Why Can't We Touch the Animals in the Galapagos? How close can we get to them? Why Can’t We Touch the Animals in the Galapagos? These past days, relatively old pictures of a tourist touching and carrying some of the Galapagos Islands’ most iconic species – like land iguanas and Galapagos giant tortoises – have found their way back on the web. Even though they were taken in 2009 and despite the fact that the Galapagos National Park (link only in Spanish) addressed the situation, they remind us of how far we still have to go when it comes to the preservation of life in the archipelago. We are all agents when it comes to protecting the environment and we cannot turn our backs when something like this happens. How close can you get to the animals in Galapagos? All guests must maintain a minimum distance of at least six feet (two meters) from wildlife to avoid disturbing them, even if they approach you. The Galapagos Islands are certainly one of the most marvellous places you will ever get a chance to visit. There is something special about the way the black volcanic rocks contrast with the white sand, or how the vegetation turns from a vibrant green to an ashy grey with the change of the seasons. You cannot help but feel drawn to the warmth of its people, the crystalline turquoise waters, and the close interaction visitors get to have with its amazing wildlife. Humans and animals have learned to share this space and peacefully coexist, but human impact still remains as a great threat. The aftereffects of our uncontrolled consumerism, our unchecked CO2 emissions, and practices like hunting and overfishing are felt all around the globe. However, it’s not too late to do something about it and every grain of sand counts. Galapagos is no stranger to the consequences of global warming and lack of information which, for many years, affected the islands to distressing levels. Luckily, measures were taken at the appropriate time and ever since they were put in place, the archipelago has been thoroughly monitored in order to protect its fragile ecosystem. Everyone is involved – both visitors and inhabitants – when it comes to protecting the islands. With the purpose of preserving it for future generations, the Galapagos National Park designed a set of rules to safeguard the unique flora and fauna of this magical place. They are meant to help visitors leave as little a trace as possible so that animals and plants can go about their lives without being affected by human presence. It may sound obvious to some, but one of the most important Galapagos rules is not to touch the animals. Wildlife in the Galapagos archipelago is so unbothered by the presence of humans that people can get extremely close to each creature without them even moving an inch. This level of proximity certainly has its appeal and might even turn into an urge to want to touch and pet the animals. However, humans remain carriers of viruses, bacteria and smells against which the animals cannot defend themselves. It may seem harmless to lightly touch a Galapagos sea lion pup given how unbearably cute they are, but a quick touch is all it takes to transmit our smell and germs to the pup. When its mother comes back from hunting, she will look for her pup and recognize it by its smell. The moment she detects human smell on it, she will immediately reject it. If the pup is still in its nursing stages, it will not be able to fend for itself and it will die. Human germs can also spread to colonies and groups of specific species, putting them all at risk. Feeding them is also forbidden. In order to leave visitor sites with as minimal a trace as possible, food is not allowed during walks and excursions. In the same way we’re often compelled to feed a dog, it’s tempting to feed the animals in the Galapagos. But know that this action could gravely harm their behaviour and health. Not only are they not used to eating human food, they could also start losing their instinct to feed themselves if the food is handed to them regularly. Animals in the Galapagos are responsible for maintaining a balance between species as well as carrying and spreading seeds. This perfect equilibrium must not be disturbed. 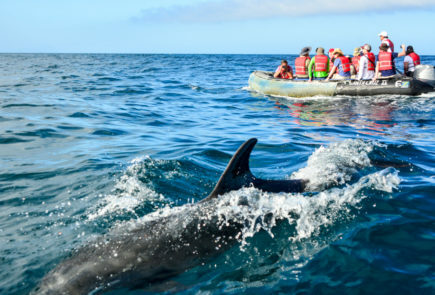 Visitors who come to the Galapagos instantly become a participant in its protection. Park entrance fees and responsible behaviour contribute to the conservation of this amazing place. Please be sure to read through the Galapagos National Park Regulations below. Keep in mind that they are designed to keep you and your family safe while protecting the unique and fragile Galapagos environment. When you get the chance to visit the islands you will fall in love with them, and you will understand why it’s so important to get involved in the conservation efforts. Again, Why Can’t We Touch the Animals in the Galapagos? The Galapagos Islands are one of Ecuador’s most important touristic destinations. As a result, tourism agencies – like Metropolitan Touring – operating in the islands are obligated to follow sustainable practices, to follow the rules and they usually do their best when it comes to keeping the islands safe. But they can only do so much. It’s mostly up to us, the visitors and inhabitants of the Galapagos, to show the world how much we care. We are all just passing through this beautiful archipelago that isn’t ours for the taking. So let’s give others the chance to fall in love with it too. 1. Visitors to any protected areas within the Galapagos National Park must be accompanied by a naturalist guide authorized by the GNPD. 2. Travel only with tour operators and/or boats authorized to work in the protected areas of Galapagos. 3. Remain on marked trails at visitor sites and respect signs at all times for the protection of wildlife, and for your safety. 4. Maintain a distance of at least six feet (two meters) from wildlife to avoid disturbing them, even if they approach you. 5. Never feed wildlife, as this can cause health problems. 6. Flash photography is not permitted when taking photos of wildlife. Professional photography and videos recorded for commercial purposes must be authorized by the GNPD. 7. Camping is only allowed in a few authorized areas in the Islands. Request authorization to camp at the Galapagos National Park’s offices at least 48 hours in advance. 8. It is your responsibility not to introduce food, animals, or plants into the Archipelago. Cooperate fully with all environmental inspection and quarantine officials during your visit. 9. Do not take or buy any products or souvenirs made from banned substances, including black coral, shells, lava rock, animal parts, or any native wood or vegetation prior to leaving Galapagos. This is illegal and must be reported. 10. Practice “leave-no-trace” principles in order to maintain the beauty of the environment. 11. Pack out all trash and dispose of or recycle it in the populated areas or on your tour boat. 12. Smoking and/or campfires are strictly prohibited within the Galapagos National Park, as fires poses a serious risk to the flora and fauna of Galapagos. 13. Fishing is only permitted on recreational tour boats authorized by the GNPD. 14. Motorized aquatic sports, mini-subs, and aerial tourism activities are not permitted in the Galapagos National Park or Marine Reserve. How much does it cost to travel to Galapagos? Planning a trip to Galapagos next year? Here are 4 steps to help you make it happen!